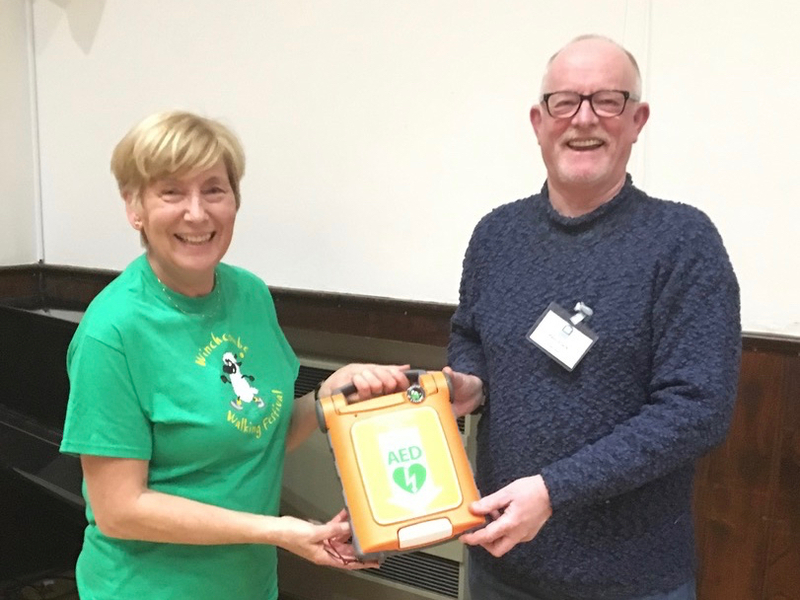 Sheila Talbot, Chair of the Winchcombe Walkers are Welcome presented a defibrillator to the North District Cotswold Voluntary Wardens at their AGM in Lifford Hall, Broadway on 21st March. Sheila said “Winchcombe Walkers are Welcome simply couldn’t have achieved so much over the past 10 years without the help of the Cotswold Voluntary Wardens. Work parties in North District go out several times a week looking after the footpaths and walk leaders help out at our annual walking festival”. “Over the years we have built up a nest egg from selling guide books and running walking festivals. As a group we felt we would like to give something back to the Wardens and a defibrillator seemed like a good idea. We hope it will never be needed, but the Wardens work outdoors in remote places and it would take a long time for medical help to reach them in an emergency. Having the ‘defib’ with them in the truck could make the difference between life and death”. Rebecca Jones, the Warden’s co-ordinator who works for the Cotswold Conservation Board said “The Conservation Board would love to buy defibrillators for every work party but sadly the budget cannot cover it. We never expected to be given one so we are absolutely thrilled”.